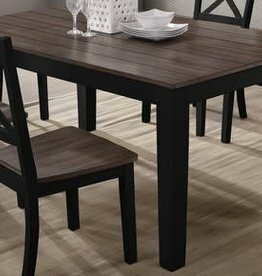 Farmhouse-style traditional height rectangular dining table. This table features a grooved driftwood finished tabletop. Made of real rubberwood. Finish: Distressed black bottom w/ Driftwood stained top. 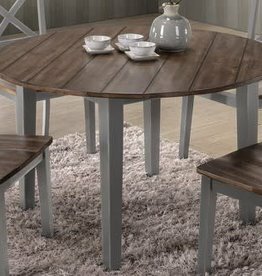 Farmhouse-style 48" round dining table with grooved driftwood finished tabletop. Made of real rubberwood. Finish: Distressed gray bottom w/ Driftwood stained top.